Laddoos somehow manage to evoke that festive feeling every time I bite into it. 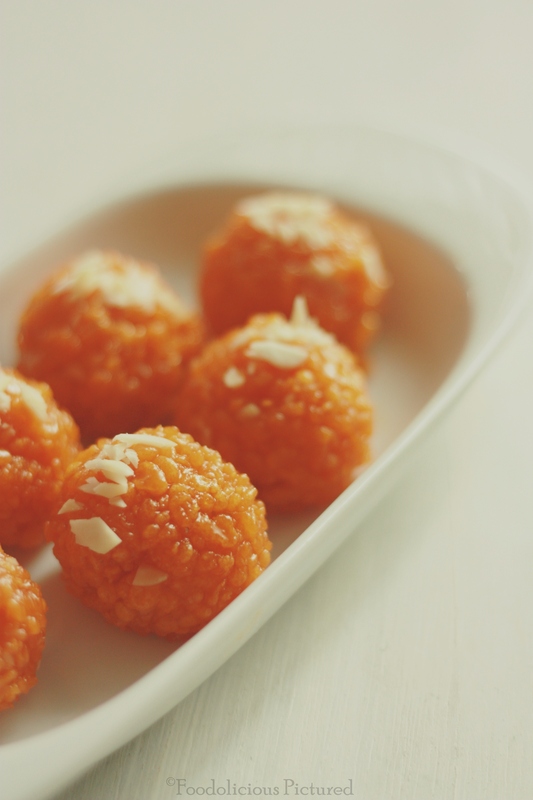 Considered as an auspicious presence in almost every other festive or religious occasions, these are a must try for those who are blessed with a sweet tooth. Laddoos are available at most of the Indian stores/delis outside the country. And it’s not that difficult to prepare at home, and as they say – nothing like homemade! Chickpeas/besan flour along with clarified butter and a pinch of orange food color is mixed and made to a thin batter which is then poured through a perforated spoon/ladle into hot oil. Soon the batter hits the oil it forms into tiny balls called boondis. Later soaked in sugar syrup and rolled into equal sized balls once the boondis absorbs all the syrup. You can garnish them with pistachios, almonds, cashews or raisins. Make sure you let them sit for a couple of hours after you roll them into balls. In a mixing bowl, mix together the besan flour, food color and ghee. Then make a thin batter by adding enough water. Heat oil/ghee in a deep frying pan, Hold a perforated spoon/ladle over the frying pan and pour the batter little at time. The batter will fall through the ladle into the hot oil. Fry these tiny balls/boondis till golden but do not let them cook till crisp. Remove and drain on a kitchen towel. Repeat with the rest of batter. To make the sugar syrup, In a pan, bring the water to boil and dissolve the sugar over low heat. Stir in the rose water, food color and powdered cardamom. Once the sugar has dissolved; continue to boil till the sugar syrup reach a string consistency. Add the boondis to the sugar syrup and mix gently. Continue to cook over lowest flame till the boondies have absorbed all the syrup. Turn the heat off and spread this on a plate; sprinkle chopped almonds. 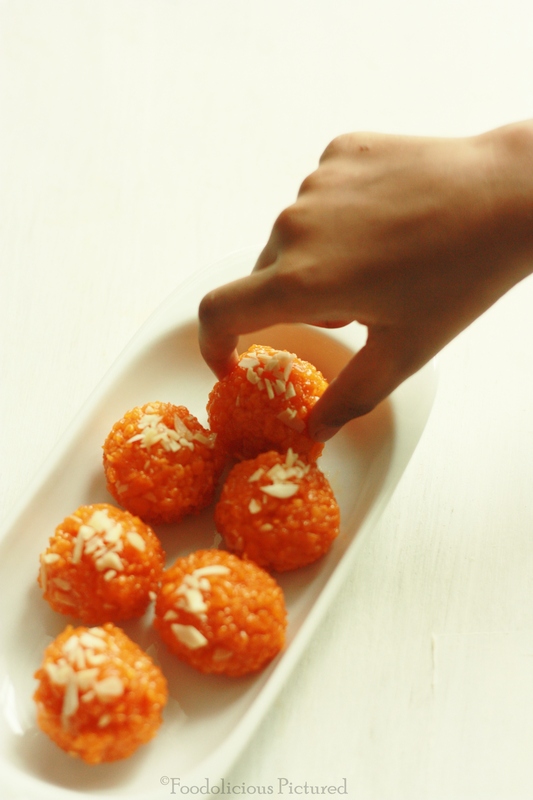 To shape the ladoos, divide the mixture and roll into equal sized balls. Garnish with chopped almonds. 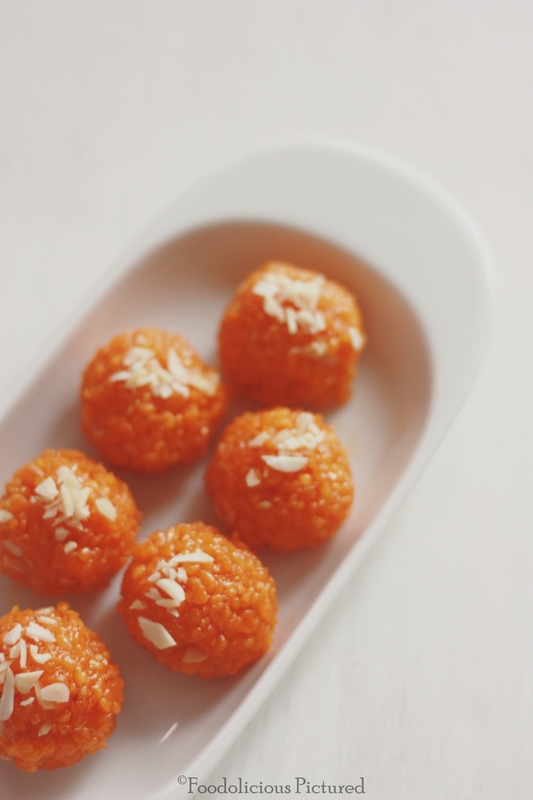 Let the ladoos cool completely and rest for about 3-4 hours before you serve them. Ohfff undampori ladooo ellam kanichu kodipichuu.. I have been thinking of buying the sp ladle for ladoo u are tempting me to go for it . You rock Rekha!! 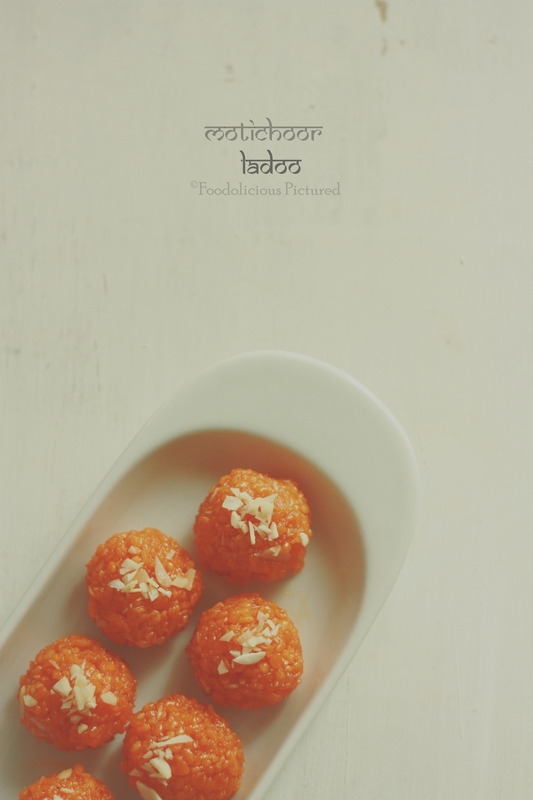 These ladoos look purrrfect! Craving! Want! Now!